I like the way Sheryl Sandberg put it in her well-known book, Lean In, comparing career paths to jungle gyms, rather than ladders. It's not about who you step on or climb over to get to the top, in fact, there really is no top because you can lose your job or have life events that change your status instantly. Early in my career, I volunteered for committee roles in a professional organization, American Advertising Federation of Nashville (AAF Nashville). I did this to gain experience and meet people who could potentially help as I advance my career. I was reaching up to climb higher on the jungle gym. As my career took many dips in being laid off, I held on to the connections I made through volunteering and networking at various marketing industry events. I circled my way around on the jungle gym, trying not to fall off. Often, I interact with others in similar career positions as me. We are there to hold each other up on the jungle gym. After taking the initiative to start a professional networking group of my own in 2009, Social Media Club Nashville, I'm starting to see a shift in people reaching out to me for advice and assistance. I'm offering them a lift up on the jungle gym. I embrace the irony in career karma, making a point to help everyone that I can because I've been in their position and am still reaching out to those more experienced than me. The person in career transition that you help today could be the one that introduces you to your next boss. You never know where your next move will be on the career jungle gym. I recently participated in a 24-hour Design-A-Thon whereNashville's creative community donated marketing and design expertise to benefit Tennessee Literacy Coalition (TLC). I volunteered my time, not necessarily needing the experience or connections, but really giving back to the community. My role was on the Design-A-Thon marketing team, where we provided TLC with a twitter and blogging strategy, complete with SEO and social media training materials for their staff. They were so grateful for the expertise. I was crying by the end of Design-A-Thon watching the Tennessee Literacy Coalition YouTube videos of the people we were helping. It was then that I realized the impact. It felt good to contribute and release some good career karma. Whether you are volunteering for a professional organization, non-profit organization, or just helping someone reach their next career goal, I encourage you to remember that we are all a little higher or lower at times on the career jungle gym. Helping others will ensure that someone someday helps you. 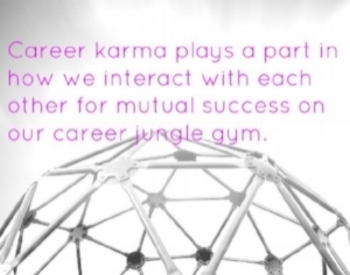 It's just jungle gym career karma. #SMCNASH Social Care Event Recap + Top Tweets!